The tradesmen of 21st century America. A photo essay by Troy Paff. What is The Journeyman Project? Newburgh, New York. Dirty Jobs producer Dave Barsky called a couple of days ago to recruit me for a last minute show for Discovery. 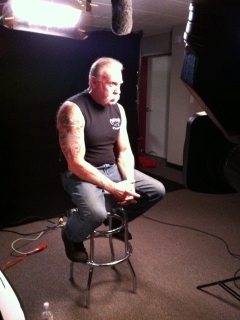 American Chopper is ramping up for a renewed run on the network, so suddenly half of the DJ crew is in New York shooting a behind-the-scenes special about the way Chopper is produced. (Since Paul Senior and Paul Junior are at war, production requires two dedicated crews to operate autonomously.) Shooting interviews with the crews as well as the talent has been interesting. And yes, the family war is real. After a week in Newburgh I’ll be driving home to New Mexico to host my family for Christmas. I’ll be back to the blog in the New Year. Happy Holidays! This entry was posted in Journal and tagged American Chopper Senior vs. Junior, Senior Teutul. Bookmark the permalink.